“Yeah, right,” mumble the Important Assets. In the rush to bring next-generation services to consumers whose lives are built around the premise of constant connectivity, overlooking those who have no connection at all unfortunately happens. With 50 launches together over the last 30 years, for more than 20 different satellite operators, Arianespace and SSL have mastered the art of teamwork. Earlier this year, Hughes Network Systems (Hughes) announced that the company had been selected by Grupo Pegaso to supply its JUPITER™ System to help close the “digital divide” for communities in rural Mexico. Since the launch of the first batch of CubeSats, on June 30, 2003, a total of 277 of these tiny satellites have been placed in orbit, either via a launch vehicle or deployed from the International Space Station (ISS). The seemingly endless, albeit occasionally entertaining, debate over which technology is best suited for slinging bits into space pits the benefits of Solid State Power Amplifiers (SSPAs) against those of Traveling Wave-Tube Amplifiers (TWTAs)—which one is the best choice for any given application? On May 14, mission managers at NASA’s Jet Propulsion Laboratory, Pasadena, California, declared the space agency’s new Soil Moisture Active Passive (SMAP) observatory ready to start its minimum three-year science mission. India Uses SATCOM To Bridge Medical Education Gaps, By Shilpa Choudhury, Marketing Manager, Hughes Communications India Ltd. The International Monetary Fund predicts that India will eclipse China as the world’s fastest-growing major economy in 2016. Metadata-rich streams enable additional advertising revenue as consumers’ viewing habits change. 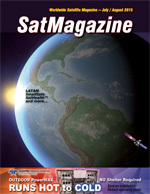 Fast, Secure Broadband Connectivity Via “Fiber In The Sky”, By Vern Fotheringham, CEO and Chairman, LeoSat, Inc.
With the ever-increasing demand for fast, uninterrupted coverage and connectivity worldwide, this is an exciting time to be active in the satellite broadband market. On August 16 of last year, Mark Simons, a professor of geophysics at Caltech, landed in Reykjavik with 15 students and two other faculty members to begin leading a tour of the volcanic, tectonic, and glaciological highlights of Iceland. The new high throughput satellite (HTS) systems that have been announced or deployed have created great anticipation among satellite customers for major performance improvements. Nano and microsatellite launches have increased at a 61 percent compound annual growth rate since 2010; the number of unique operators launching these satellites has increased at a 31 percent CAGR over the same period.